Trade show giveaways, also known as trade show swag, freebies, samples, handouts, and traffic builders, are generally sold by promotional products companies and can be a great method to further promote, market, and advertise your company and products or service for trade shows, conventions, conferences, and other marketing events and gatherings. Tradeshow give-a-ways can be a great way to pull more traffic to your trade show booth. That said, trade show giveaways and promotional products can also be a quick and easy way to waste a lot of money if you choose the wrong giveaway or promotional item, or if you use them in the wrong way. There are several rules you should follow when you are evaluating and selecting trade show giveaways and promotional products, as well as what I think are some good trade show giveaways ideas, and some bad trade show giveaway ideas that are best avoided [or suggested to your trade show competitors for their tradeshow swag :) ]. 1. First, your tradeshow giveaway should be useful. Don't pick something that will be thrown away as people are leaving the convention center, or left behind in their hotel room trash can as they are packing to go home. 2. Second, it may seem obvious, but your trade show giveaway needs to have your company name on it. It also need to have your contact information on it, preferably both a toll free phone number and a website. If possible, your trade show giveaway item should also include a tag line that says what your company does, and also if you can, it can look more professional and eye-catching if you have a company logo that you can imprint on it. 3. Third, your trade show giveaway must make economic sense. This means that if you are selling a low price item, you probably can't afford a high priced giveaway item. It is usually a good idea to have a low-cost (cheap) general giveaway item such a a custom-imprinted pen that you can offer to all people, and a more expensive giveaway item such as a custom-imprinted USB memory stick that you can offer to higher value prospects. 4. Fourth, you want to use your trade show giveaway to draw the right crowd, which means you want to draw qualified prospects to your booth - that is, people that you could do business with and sell you product or service to. Don't offer an ipad to anyone from the general public if your prospects are only a small percentage of the attendees at the trade show. Make sure you target your trade show giveaway at actual prospects! This is where it can be great to have a supply of low cost custom imprinted pens to give to people who you talk to that you determine are unlikely to ever be prospects or become customers. Also, see if you can coordinate your trade show giveaway idea with your overall trade show booth theme (check out these trade show booth ideas). As I mentioned above, when it comes to simple yet effective trade show giveaway ideas, I'm a big advocate of custom-imprinted pens with your company name, tag line, phone number, and website on them. They are inexpensive and can be handed out to everyone that has any interest in your company. They are also useful, and can be used at the show and later back at the prospects office. Since they are easy to carry and store, and because they are useful, they are unlikely to simply be discarded. One point to keep in mind about trade show giveaway pens is this... don't worry too much about how fancy the pen is or how you click it to get the pen to write, or if it looks more or less expensive. The key instead to a good trade show giveaway pen is how many lines of information you can have imprinted on it. Often the expensive pens will only have one or two lines, so all you can print is your business name and phone number, but the "cheap" promotional pens will let you print four lines of information, so you can have your company name, your phone number, your website, and your tag line. So the most important thing about selecting a promotional pen style is not what kind of pen it is (as long as it writes), but how much of your company information you can print on it! On the flip-side, when it comes to trade show giveaway ideas I would avoid, I see a lot of stress balls handed out at trade shows, but I think they are a bad idea. I see almost as many stress balls end up in the trade show hall trash cans or hotel trash cans. They may seem like a good idea, but it seems like they usually get thrown out fairly quickly. I also see a lot of key chains handed out as promotion giveaways at tradeshows and conventions, which seem like another not very good idea. How many people have their keys jangling around lose in their pockets, because they've never gotten around to getting a key chain? I think very few, and maybe none. If people have keys, they probably already have key chains. And if you've ever tried removing keys from a key chain to move them to a different key chain, you know that it's not very easy, and it's also a good way to break a nail. So what are the odds that anyone would use a custom keychain if you gave it to them... and what are the odds that it would end up in the trash can? An uncommon but good trade show giveaway idea, in my opinion, it a collapsible beverage coozy (koozie). The old style solid foam coozies took up too much space, but now one can get foldable koozies that lay flat. The thing I like about coozie foam beverage holder for giveaways it that they are useful, and people hold on to them (they really never wear out). I have several coozies in my kitchen pantry that I have had for years. Another benefit of the koozie is that they have lots of space for printing your company name, logo, and contact information, and hence make a great "advertising billboard". One thing to keep in mind is that if a person has several koozies and is deciding to throw some out, you want them to keep yours. So in addition to your company name and contact info, put a funny or clever saying or picture on it as well, so people will find it interesting (maybe even a "conversation piece" if you are really lucky) and will want to keep it. Another time-tested great idea for promotional marketing giveaways, in my opinion, are custom coffee mugs and custom printed water bottles... if they are done right. Most people use a coffee mug or water bottle, and both of them allow a lot of surface area for customizing with your company name and logo and contact information. The key to making sure people keep your coffee mug or water bottle is, just like with a custom koozie, you need to also put something like a picture, drawing, or saying, that if uniquely funny, cute, or clever. You need to make sure that when people are clearing out their cabinet or pantry, they will throw out the other mugs and bottles, but will keep your trade show giveway coffee mug or giveaway water bottle because it is funny, clever, or cute! A slightly more expensive trade show giveaway idea that I like is the USB memory stick that I mentioned above. Like the pen, it is easily stored in ones pocket, and if you hand them out, I would suggest you recommend to the person to put them in their pocket instead of in their "trade show goodie bag" where the USB memory stick can get lost with all the other trade show giveaway stress balls and stuff. It's a good idea if you can pick a promotional product that is somewhat unique, though still useful. It's always better if you're not just another one of the dozens of trade show booths handing out LED keychain flashlights, for instance. Sometimes a picture is worth a thousand words, and an example is better than lots of generic advice. Here's an example of a unique and useful giveaway that (most) people would keep and use, and would talk about when the use it. 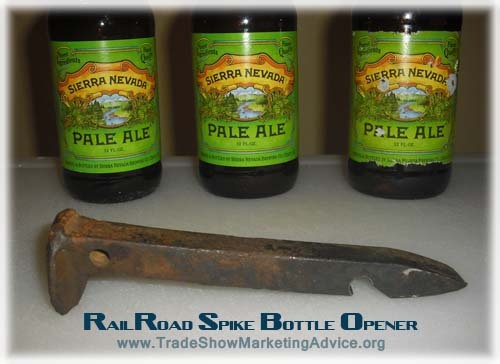 I call it the "railroad spike beer bottle opener", and I made it myself. Whenever people are over and need to open a beer I hand it to them. I have yet to have anyone not ask me all about it. Now image if your company name was on it. A guaranteed conversation piece. And the idea is absolutely free! Feel free to hand out all you want. I can't tell you where to get them though, since I made this one myself by hand in the garage. Even if you don't use this idea, you get the point. Make sure your tradeshow giveaway is USEFUL and UNIQUE! Green trade show giveaways (also recommended as eco-friendly, earth-friendly, and environmental giveaways) seem to be all the rage these days and get a lot of reviews. I like the idea of green trade show giveaways, but I think of "being green" a little differently. Most people think of green as being made out of "recycled plastic" or "bamboo". I think it doesn't matter so much what material your tradeshow give away is made out of... what really matters is what people do with your giveaway. If they end up throwing it out with a few days, and it ends up in the landfill, does it really matter if it was made from recycled plastic or if it was 80% post-production-certified-green-natural-material (whatever the heck that is). As I said above, if people hold onto your giveaway and use it, and don't just throw it away, then no matter what it is made out of, it is a GREEN trade show giveaway! Plus, instead of seeing your company name and marketing message ONCE (and only if they notice it as they toss your giveaway in the trash), they will see your company name EVERY TIME THEY USE YOUR GIVEAWAY! So using my idea for a "green trade show giveaway" is really a win-win. It's a win for the environment AND a win for you and your marketing success. If you want your promotional giveaways to be green, then come up with giveaways that are truly useful and that people will keep. Are you still not sure what promotional product giveaway item or idea is the best? Remember that every trade show exhibitor is unique, and the promos that might work for one company might not work for another. You definitely want to make sure that your tradeshow give away fits in with your overall trade show marketing strategy and goals. It's even better if your giveaway swag is related to your company and your product, and often the best giveaway idea is also the most obvious but overlooked giveaway... give out a free sample of your product! Free samples are a great way to show prospects the benefits your offer, and if it's a sample you produce it is by definition unique, and trade show attendees can only get it from you. So don't forget to consider the power of a free or discounted sample. Some companies have bigger budgets and can spend more per promo giveaway. Other companies are targeting specific audiences like computer geeks or snowboarders, and the same giveaway may not work for the different groups. Here are some other random tradeshow giveaway and promotional products ideas in no particular order: calendars, temporary tattoos, bumper stickers, refrigerator magnets, travel mugs, decals, antenna balls, lapel pins, luggage tags, flashlights, wine bottle openers (corkscrews), beer bottle openers, shot glasses, logo wine glasses, carabiners, baseball caps, t-shirts, bandanas, flashlights, umbrellas, highlighters, and tins of breath mints. Before you commit to a particular promotional product or giveaway, make sure it makes sense for your company and it's also the most effective giveaway you could choose. Many people will ask me, what are the best giveaways and best giveaway ideas? Hopefully after reading this article you'll already know what my answer is going to be. My answer is simple, there are no "best trade show giveaways". What is the "best trade show giveaway" all depends on your company. It depends on your budget and what you can afford to spend on each giveaway (e.g. whether you can afford premium giveaways, "blue collar" giveaways, or whether you just need a really inexpensive, cheap giveaway idea). It depends on who your prospects are... whether they are senior citizens or teenagers, or whether they are wine snobs or sports nuts. You probably should focus on unique custom trade show giveaways and not generic promotional giveaways, but by "custom giveaway" I don't mean an expensive, unique, handcrafted, one-of-a-kind specialized widget... I mean an economical, mass produced, USEFUL giveaway item that your prospect will hold on to... but that is "customized" with your company name and corporate logo, and even better, a unique funny or thoughtful tagline that distinguishes it from the other similar giveaways with other company names on them. Remember, your goal is not only for your prospect to take your giveaway... your goal is for your prospect to KEEP your giveaway. So maybe in a way, the best trade show giveaway is a promotional product with your company name prominently displayed on it that your prospect will KEEP. And also don't forget that sometimes the best giveaway in something truly unique to your company... a free sample of your product. If your samples are fairly expensive, just make sure you can afford to hand out the samples and that they are going to qualified prospects. Finally, allow me to share a brief thought on the ubiquitous bowls of candy you usually find at most trade shows because somebody told somebody else that it is a good idea for every trade show display to have a bowl of candy at it. Avoid the temptation to have a bowl of candy at your trade show booth. Why? Because if you're human, you'll end up snacking on the candy, and then as the afternoon wears on you'll experience a post-sugar-energy-crash (I speak from personal experience). Eat a good breakfast, and a good lunch, and don't snack on candy or junk food. Also, having a bowl of candy at your tradeshow booth will draw everyone into your booth... but you don't want to pull everyone into your booth, you want to pull in qualified prospects! Let the booths around you supply the trade show masses with m&m's and bite-sized candy bars... you need to figure out a good, effective trade show giveaway idea, and then hand out your trade show giveaway to qualified prospects that visit your exhibit booth. update: How you "give away" your giveaway matters! I recently read a really interesting article on the psychology of trade show giveaways. I wish I had bookmarked it, because now I can't find it. But this is what I remember it said. It's just as important how you give out your giveaway as what your giveaway is. What this means is that instead of just handing the giveaway to any random Joe who walks by, make people "earn" it. Make them do something to "earn" the giveaway, and then they will value it more. You can have them fill out a survey or answer some questions, for example (which is also a great way to collect actionable data). But an even better suggestion would be to have a contest or competition of some kind. Even if it's a simple as spinning a prize wheel or filling out a raffle ticket for a chance to win a "prize", having some kind of trade show contest makes it fun and also makes people feel good when they "win" something. Even better is if they can win because of their "skill", which is why miniature putting greens and miniature basketball courts for shooting baskets are common contest ideas that allow people to "earn" or "win" their free give-away. Just remember that you want to make sure that you come up with a trade show contest that fits in with your overall trade show strategy. Your trade show contest should draw in potential prospects, and not just clog up your trade show booth with a bunch of people wanting to have fun at your contest but who are blocking the real prospects from getting to your booth space. So remember that in addition to thinking about what the best tradeshow giveaway might be for your company, also think about a clever and/or fun way to hand it out, so that people "earn" the giveaway and feel good about getting it. There's nothing wrong with a "cheap trade show giveaway"... as long as it works. Remember that your giveaway will have your company name on it, and thus it represents your company and what a potential customer can expect from it. I'm a big fan of cheap tradeshow giveaways, because you can buy more of them and thus give them away to more prospects, but if you're buying a cheap giveaway, you want to pick an item that is essentially bulletproof, and that can be tested to make sure it will hold up long term. Nothing is worse that handing out swag at a show, and when your prospect gets home or back at the office and goes to use your swag, it breaks or doesn't work! That is not the impression you want to create! For example, a potentially "safe" cheap giveaway would be a metal beer bottle opener with your company name engraved on it. You can order a few samples first and confirm the quality of construction and also test it out on a six pack of beer (which has its own benefits!) and then be reasonably assured that your cheap beer bottle opener giveaway will work and will also last. In general, anything primarily made of metal that is for mechanical use is usually a "safe" cheap giveaway, and you can always test and evaluate several samples. But a potentially "risky" cheap giveaway is anything electrical. An example and the inspiration for this update on the risks and rewards of using cheap giveaways would be a cheap LED keychain flashlight. I speak from experience because I got a dozen sample LED keychain size flashlights (or LED penlights as they were called) for under a buck each. Half of them didn't even work when I first tested them, and most of the rest stopped working after being used only a few times over about a week. Image the impression I would have made if I'd handed out a thousand of these cheap LED keychain flashlights at a trade show or convention? NOT. GOOD. So when it comes to cheap trade show giveaways and cheap promotional giveaways, you don't necessarily have to avoid them, but just make sure whatever you decide to get is essentially bulletproof, and won't easily break or stop working. It's very important to stand out from all the other trade show booths at a trade show, which means you need to be unique and creative. You also want prospects to remember you, which is why you want to give them something to remember you by. Here's a unique and creative idea for a trade show giveaway / trade show contest / trade show strategy all rolled into one. I came up with it in the shower, which is where I get most of my ideas, though few make it from the shower onto this website. Anyway, lets say that your going to be exhibiting at Las Vegas (although this idea would work anywhere, because everybody knows about gambling). My idea for a cool trade show giveaway is a custom poker chip. On one side, you print something like, "Don't Gamble when it comes to Toilet Plungers." And on the other you print something like "Learn more at http://www . AceToiletPlungers . com/dont-gamble.html - Ace Toilet Plunger. Quality Plungers Since 1929." I'm not sure if you could get all that on a poker chip, but you get the idea. Next you need an idea for a trade show contest like I mentioned above. For the contest to stick with the gambling theme, I'd set up a small long felt-lined open box where a person can roll a pair of dice. The rules would be simple. If they roll snake eyes, they get the big prize, like a $5 gift card for Starbucks, plus a poker chip. If they roll anything else, they get the poker chip. Thus, everyone that rolls, gets your poker chip, and you tell them when they get back to the office that they need to go to the web address on it for more information and to enter a drawing for a bigger prize. Tell them the drawing won't be open to enter until AFTER the trade show is over, so they can't enter until the following week (and thus they can't go there right away, and they need to keep the chip), and they need to enter the code on the chip to be eligible (ok, now you've got to fit a secret code on the poker chip too!). As you can see, you've got a cool trade show giveaway idea (the custom poker chip), a cool trade show contest (trying to roll a pair of snake eyes with dice), and they both synergize together to bring prospects to your website after the show, and there's a theme (gambling, which is popular, and the message that you're not gambling when you go with ACE Toilet Plungers because we make the best quality reliable toilet plungers on the market). A benefit of the trade show contest I'm suggesting (rolling dice) is that is it quick and takes up very little space, although you may want to hire an extra booth staffer to run the contest so it doesn't take away from your sales people. Whether you go with the custom poker chip idea or not, as you can see, the key here is to be creative, be unique, and make sure it all ties together into a coherent and effect trade show strategy! Please feel free to bookmark this page and visit us again. We'll be updating our Trade Show Giveaways Ideas & Tips page on a regular basis as we strive to determine the top trade show giveaways and well as the best, most popular trade show giveaways too. Come on back and visit us again soon!